TripAdvisor is a go to resource for not only travellers checking out a new destination but also for locals looking for new options. 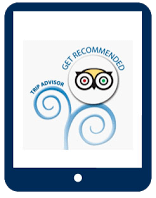 If you are in the hospitality business here in Cyprus it is essential that your listing on TripAdvisor presents your hotel or restaurant in the best possible manner. Customers can review and add photos for your establishment and it your voice can not be missing from any conversation about you! If you are looking for a solution for your TripAdvisor listing management needs contact us for a free meeting to analyze your needs. We would be happy to help you! Do you have questions on how our TripAdvisor services can be of help for your business here in Cyprus? Contact us at [email protected], call us at 70002665 or visit our offices in Nicosia for a consultation on how our TripAdvisor management services can fit your organization’s needs and help you achieve your goals.